Copperline has been training and consulting on Employment Equity for over 18 years. Our strength lies in the practical assistance we give our clients to enable them to implement employment equity planning, communication and reporting and ensure legal compliance. 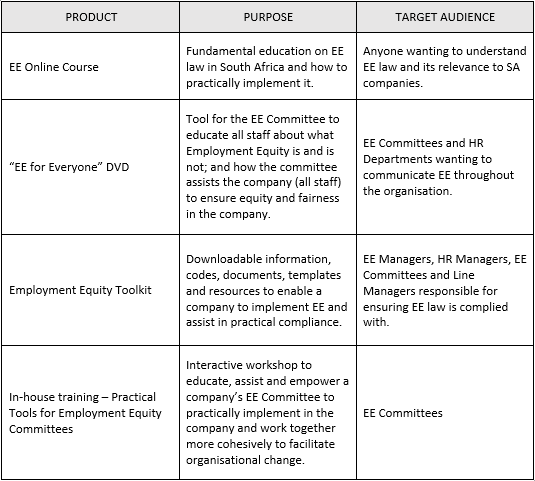 Fundamental education on Employment Equity law in South Africa, and how to practically implement it in your organisation. For more information, click here. Copperline has produced a ground-breaking new DVD to help companies with their internal communication of EE to all staff and management. This 20-minute video comes supplied with facilitator guides and support, is completely South African in context, and contains acted scenes typical to SA business’ challenges. We created this highly practical Employment Equity toolkit to give companies all they need to ensure that they comply with Employment Equity legislation. It includes guideline documents and templates to help with all your compliance requirements. If you need your Transformation / Skills Development or EE Committee trained, click here. If you need help educating other staff or managers on EE and your Company’s obligations, click here. View our Employment Equity Training clients here. Wanting more advice and information? Click here for articles on Employment Equity.